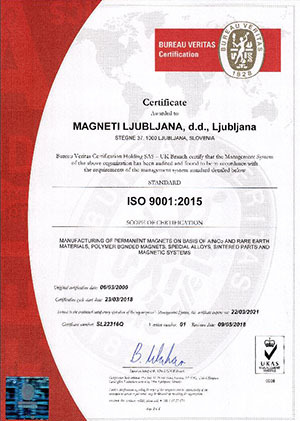 Already in 1993 the company acquired the ISO 9001 certificate for the conformity of the quality management system. 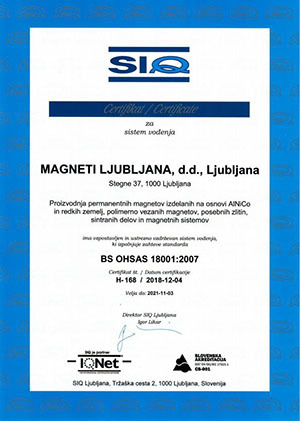 This was the first of numerous certificates of compliance to international standards, a basis for continuous improvement of magnet manufacturing processes and a precondition for strengthening of the company’s position as a supplier of high quality magnets and magnetic assemblies for the most demanding European and world markets. Following the EFQM business excellence model and acting as a socially responsible organization, in 2000 the company obtained the ISO 14001 certificate for its efficient environmental practices. 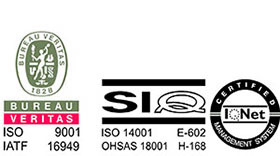 Furthermore, in 2002 and 2003 the company was awarded certificates ISO/TS 16949 for the automotive quality management system, giving special emphasis to the prevention of defects and control of the entire supply chain, and OHSAS 18001 regulating the occupational health and safety management. 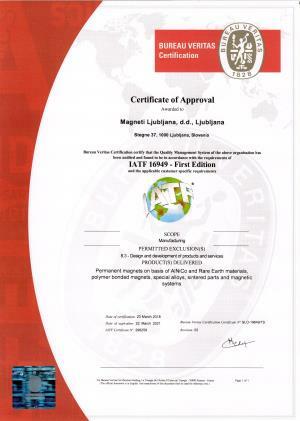 The transition from ISO/TS to IATF 16949 was completed in March 2018 and a project for transition from OHSAS 18001 to ISO 45001 is already in progress.